That catchword embraces a great example of people helping people that developed when businesses and individuals on affluent Mackinac Island raised funds for disaster victims in the Copper Country of the Upper Peninsula. Flooding in the Upper Peninsula earlier this month prompted Governor Rick Snyder to declare a second state of disaster for Houghton County, according to Michigan Radio reports. Thunderstorms struck the Upper Peninsula on Sunday, June 17 and dropped up to 7 inches of rain on Houghton and Menominee counties, as well as in northern Wisconsin and Minnesota. Three people were reported killed, including a 12-year-old Michigan boy who died when the basement in his home collapsed. 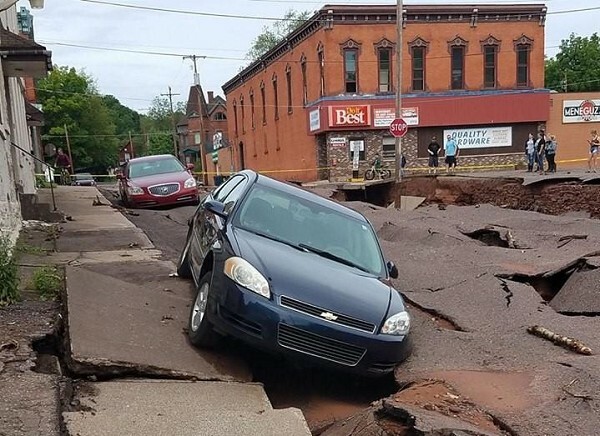 More than 60 sinkholes were reported across the Keweenaw Peninsula. The National Weather Service described the damage as "historic." According to WLUC-TV, a preliminary estimate submitted to state officials by Houghton County calculated some $50 million worth of damages to county infrastructure. Employees of Mackinac Island's Seabiscuit Cafe and Ice House BBQ held a BBQ benefit and raised nearly $10,000 to help the people affected by the flooding. The governor's declaration will open up additional resources and money for Copper Country areas that were still recovering from severe flooding in June. That flooding washed away large chunks of concrete and asphalt, damaged homes and some roads that had already been repaired.
. Last month, Snyder issued disaster declarations for Houghton, Gogebic, and Menominee counties. Employees of two restaurants on Mackinac Island came together to raise more than $9,000 and donations for the Copper Country Flood Relief. In mid-June, severe flooding caused millions of dollars worth of damage to Houghton and Menominee counties. More than 150 island residents and visitors attended the event with the opportunity to win door prizes, bid on silent auction items and listen to The Draught House Boys acoustic live. "The Upper Peninsula holds a special place in hearts of Mackinac Island residents and visitors alike," island business owner Todd Callewaert said. "We're a tight-knit community and helping each other in tough times is what we do." All the funds raised will be delivered to the Keweenaw Community Foundation, which distributes 100 percent of its funds to victims of the recent floods. Lift U.P. was sponsored by the Callewaert family-owned businesses on Mackinac Island that includes the Seabiscuit Café where staff members like Julie Savoy, have connections in the counties hardest hit by the floods. "When my house in the Copper Country burned to the ground 15 years ago the community was there to help me get back on my feet," Savoy said. "When I shared with my colleagues how much that community means to me and my family, they wanted to help and Lift U.P. is the end result of their generosity."